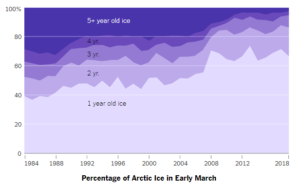 Home / Uncategorized / How old is Arctic sea ice? 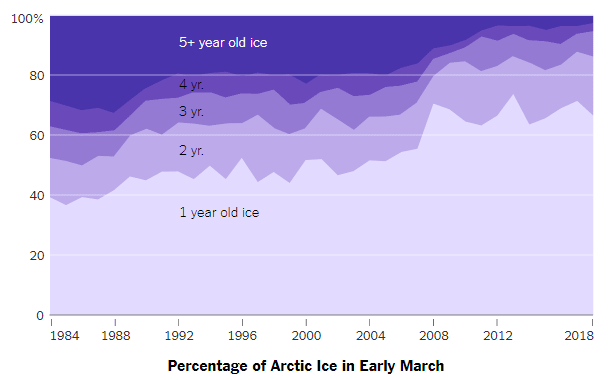 How old is Arctic sea ice? In the Arctic Ocean, some ice stays frozen year-round, lasting for many years before melting. But this winter, the region hit a record low for ice older than five years. In fact, in March of 1984 5+ year old ice made up about 30% of all ice and now it makes up only a few percent. There is also less ice overall. If you really want to explore changes in the age of Arctic ice go to the NSIDC Satellite Observations of Arctic Change interactive graph. You can choose a year from 1985 through 2916, see a map of the ice, a bar chart of ice by month by age, and have the graph animate through the months of the year. The differences over the years is extreme. You can get related data from the EASE-Grid Sea Ice Age, Version 3 page, although you will have to register. Previous What is the Great Gatsby curve? Next What is the state of the Rio Grande?